Do you feel that SEO is too hard and not worth the effort? SEO isn’t that complicated. It’s quite simple—or at least the basics are. But the basics aren’t enough to get you ranked, right? Most people who run websites have a limited understanding of SEO, so you often only need to get the basics right to succeed. You can’t optimize your website without knowing what your customers are searching for—that much is obvious. How do you figure this out? The best starting point is to use common sense. Before you do anything else, think about what your customers might be searching for and jot your ideas down in a notepad. You could even ask them directly. No need to go overboard here—a handful of ideas will do. Done? Good. Let’s do some more research. It’s likely that some of your customers are searching for your business using the words and phrases you jotted down. Whether the majority of people are is another story. So the first step is to figure out the most common way people search for what you do. You can use the ideas you’ve already jotted down to do that. Start by doing a Google search for one of the words or phrases on your list. It doesn’t matter how ridiculous or long‐winded this phrase is. I’ll use a purposely silly one to prove it. 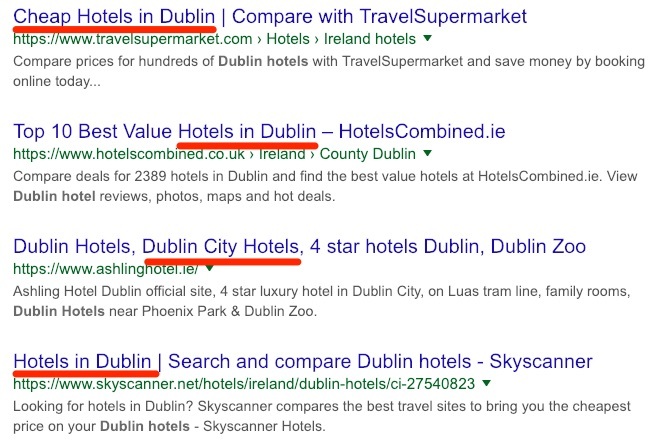 Having skimmed these results for all of 10 seconds, I can see they each have the phrase “Dublin hotels” in the title. 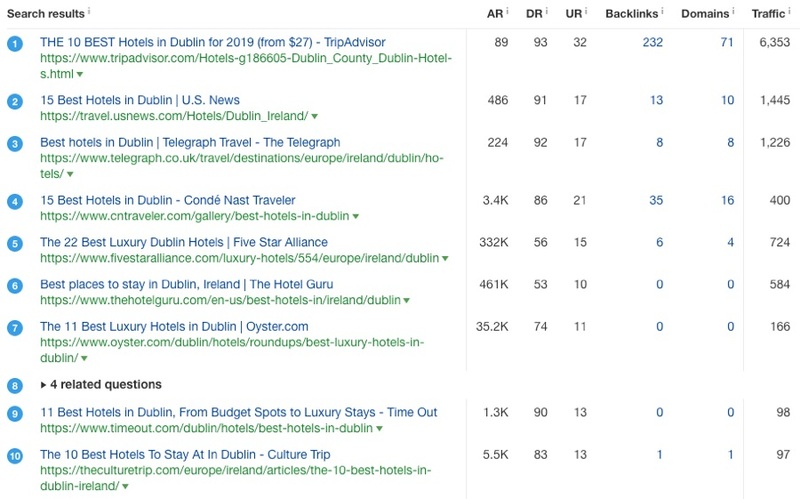 This matters because websites tend to optimize their title tags for SEO, so it’s likely that these particular ones have already done some research and found that “Dublin hotels” is the most popular way people search for places to stay in Dublin. There’s no guarantee that these folks know what they’re doing. 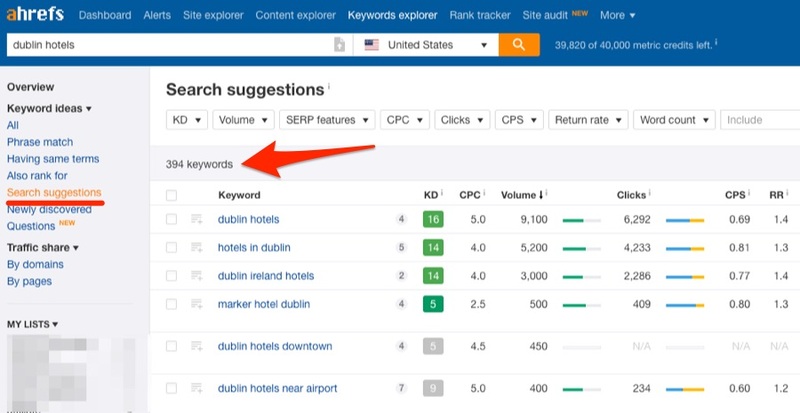 Let’s make sure this is a good main keyword to target by checking out our original search term in Ahrefs Keywords Explorer. Bingo. 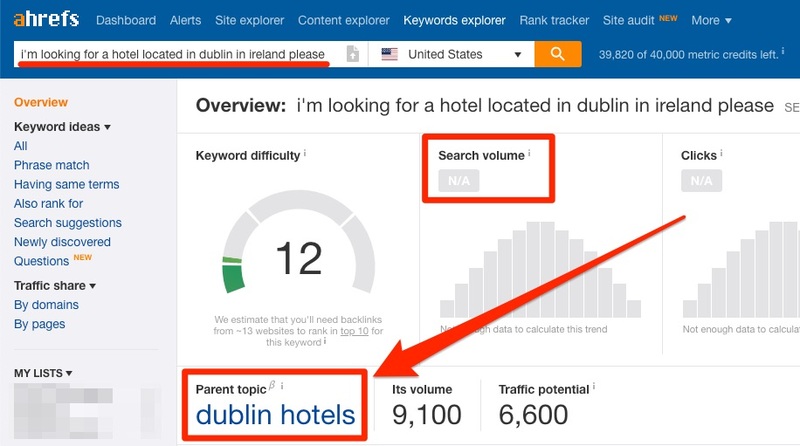 When we search for the same phrase in Keywords Explorer, it tells us that the Parent topic is “Dublin hotels” with a monthly US search volume of 9,900. It also has good traffic potential. This confirms our initial suspicions that this is a good main keyword to target. 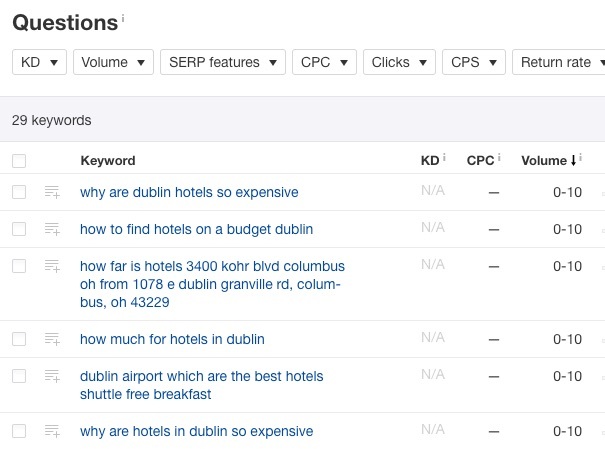 Let’s take a look at the SERP overview for “Dublin hotels” in Keywords Explorer. 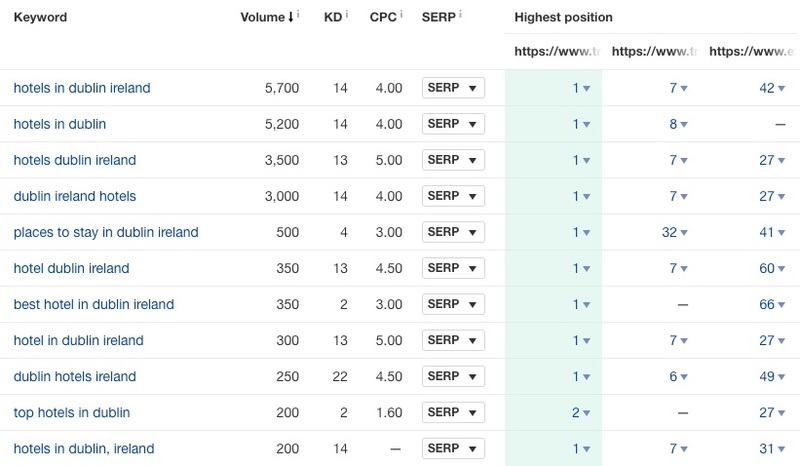 Take note of the “Kw.” column, which shows how many keywords for which each of the top 10 web pages rank. The average here is around 150–200 keywords. In other words, each of these web pages gets traffic from hundreds of other long‐tail and related keywords. 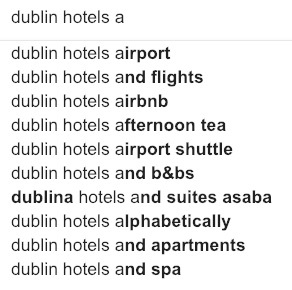 That means not everyone types “Dublin hotels” into Google when searching for a place to stay in Dublin. Other people search for the same thing in different ways. You can start to get a sense of what these other keywords are by analyzing more Google search results. Look for more similar and related phrases that pop up over and over again. These businesses have likely identified these keywords and phrases already, hence the reason they include them in their title tags. If you want even more suggestions, try the Also rank for report in Keywords Explorer. 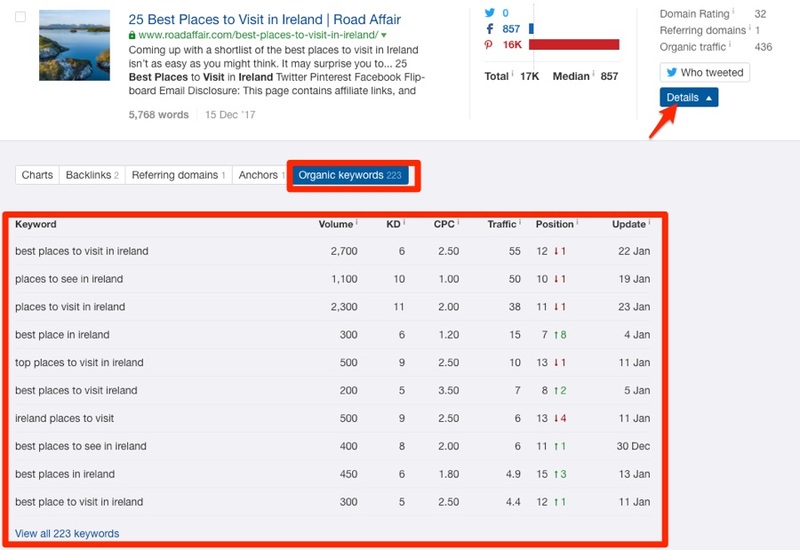 This report shows the keywords for which the top 10 ranking pages also rank. However, this report tends to surface a lot of keywords, which can be overwhelming. One way to narrow things down to only super relevant results is to take the 2–3 most relevant top ranking pages and paste them into Ahrefs Content Gap tool. That will unveil the common keywords for which all of those pages rank. Now that you know how people search for your business, it’s time to delve deeper into the more granular searches people make in relation to what you do. A simple way to start is to look at Google autocomplete results. If this sounds like a major hassle, head over to Keywords Explorer and check out the Search suggestions report. This report effectively automates the process and shows keywords generated by Google autocomplete alongside valuable SEO metrics like monthly search volume and Keyword Difficulty. Content marketing is the art of creating useful and valuable content to attract your target customers or clients. But don’t just start a blog and hope for the best—figure out what topics are popular and engaging in your field and create content related to said topics. For this, I’d recommend starting with Reddit. 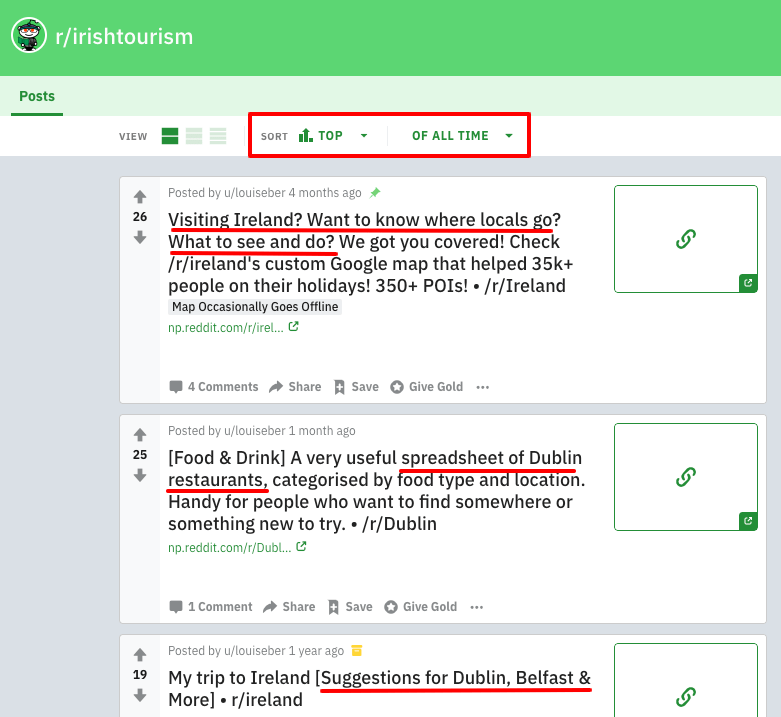 Find a subreddit related to your industry (e.g., r/irishtourism). Look at what people are talking about and which threads are the most popular. You can even filter and sort by the top threads of all time. 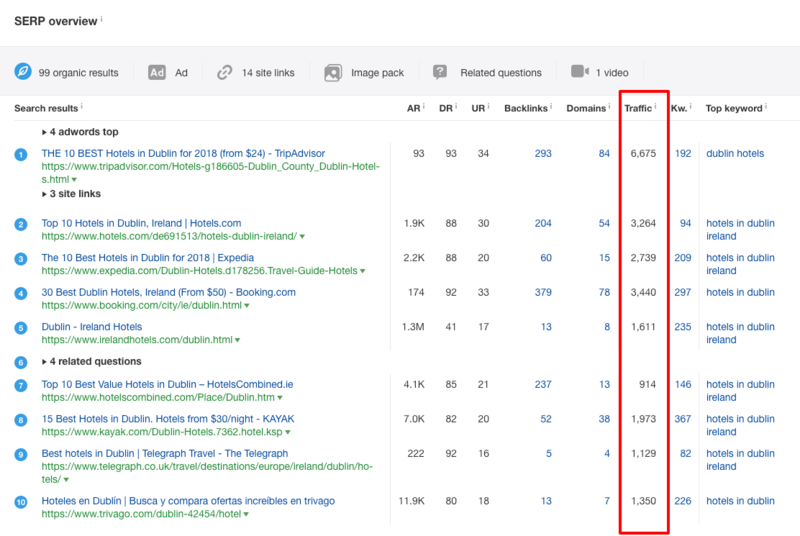 On r/irishtourism, guides and resources about things to do and places to eat and drink are very popular with folks interested in traveling to Dublin. Want to take things a step further? Content Explorer provides one of the quickest and most reliable methods to understand the most popular and engaging in a given field. Notice how I used the filters to find pages that get a substantial amount of search traffic even though they only have a handful of links? This allows me to quickly identify relevant popular topics that should be easy to rank for. I can even see the keywords for which each of these pages ranks by hitting “Details” dropdown. 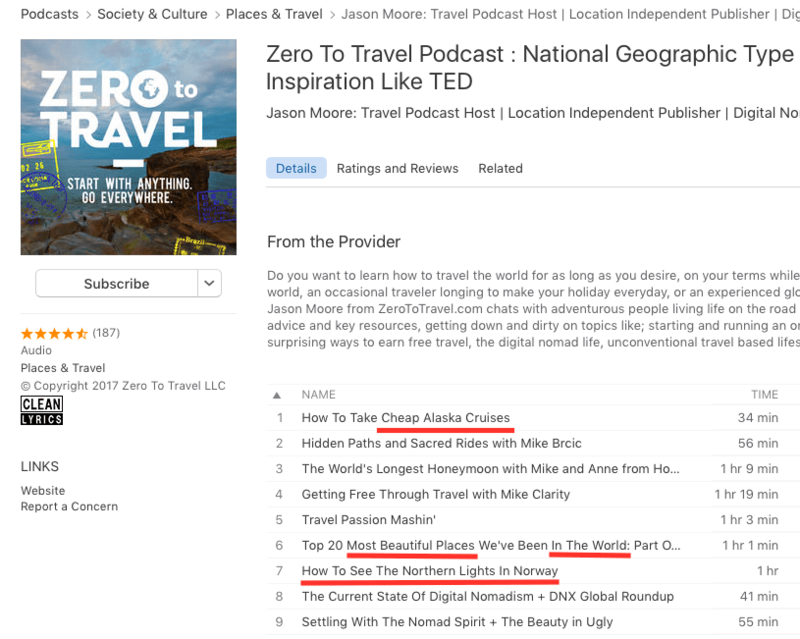 It looks like travel tips are popular. That gives me the idea that we can publish a travel guide to attract visitors and social shares. Google search results and professional keyword tools can give you a lot to get started with, but it’s in no way enough. To be successful with SEO, you need to understand how people are talking about the niche you’re operating in, what problems they have, and so on. Use every opportunity to speak to customers and take notice of the language they’re using. Doing this in person is great, but also very time‐consuming. Forums: There are quite a few communities where people discuss traveling. 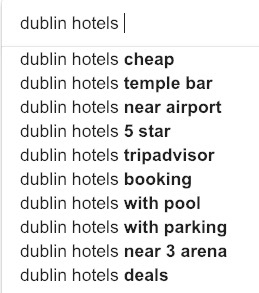 For example, a simple search led me to the TripAdvisor Dublin Travel Forum. Quora/Reddit: Quora is probably not the first place that comes to mind when you’re looking for travel advice, but you’d be surprised by the amount of information you can find there even on this topic. Where it comes to Reddit, the adage that there’s a subreddit for everything is generally true. Facebook/LinkedIn Groups: LinkedIn is more geared towards B2B markets, but when it comes to Facebook, there are groups for almost everything. Any website or social network with a large number of visitors and user‐generated content can serve as a source of inspiration and keyword ideas. Don’t be afraid to get creative here. Inspiration and keyword ideas are all around you. keyword difficulty (an estimate as to how easy or hard it will be to appear on the first page of search results for that term). These are important as they provide useful insights into the potential of the keyword and how difficult ranking for it is likely to be. However, instead of looking solely at search volume, you should try to figure out the true search traffic potential for each keyword. That way, you can focus your efforts on ranking for the ones that are likely to send the most targeted traffic your way. This tells you the estimated total monthly search traffic to each of the top‐ranking pages. 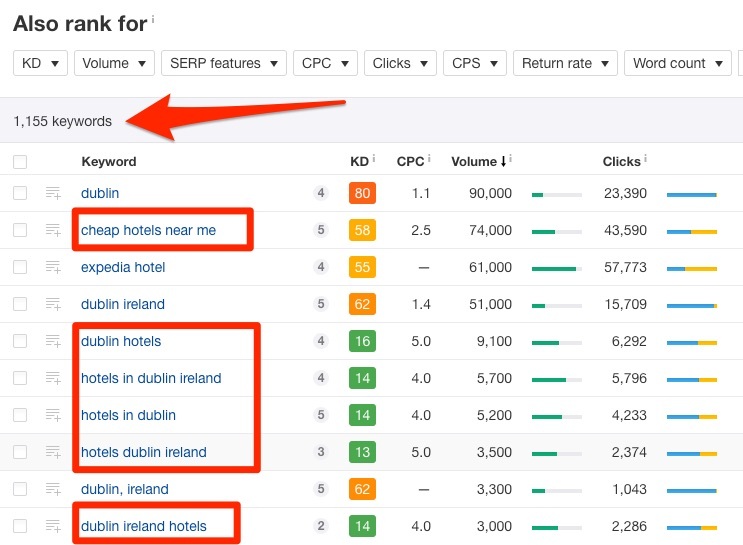 You can also see that these pages (which rank for Dublin hotels) also rank for many other related keywords. Looking at these stats gives you an idea of the kind of traffic you can expect to get to your page if you manage to rank. Note that true traffic potential can significantly exceed the search volume of the keyword you’re researching. Keyword research is an essential aspect of SEO, and it can be intimidating to those new to the field. However, understanding the basic concepts and metrics is a must for every website owner who wants more organic traffic. To dive deeper into professional keyword research, check out our extensive guide on the topic. After you figure out the keywords for which you want to rank and what searchers are expecting to see when they type them in Google, you need to assign those keywords to the pages on your site. It’s worth creating a map (in a spreadsheet or another file) that ties each keyword in your plan to a page on your site. Keyword research is only the first step towards attracting more organic search traffic. You also need to make sure your pages are structured well and satisfy the person behind the search to rank for the keywords you selected. Your optimization efforts should start with making sure that your visitors are enjoying the user experience (UX) your website provides. Use design and typography that makes it easy to consume the content, and remove any unnecessary elements such as pop‐ups, opt‐in boxes, etc. that can annoy your readers. On‐page optimization is the next step in your SEO strategy. Even targeting the most profitable keywords with the “best” content won’t help you if your pages are not optimized for search engines. There are many ways to implement the features I discuss in the following sections, but if you’re using WordPress for your website, I first recommend installing an SEO plugin like Yoast SEO. 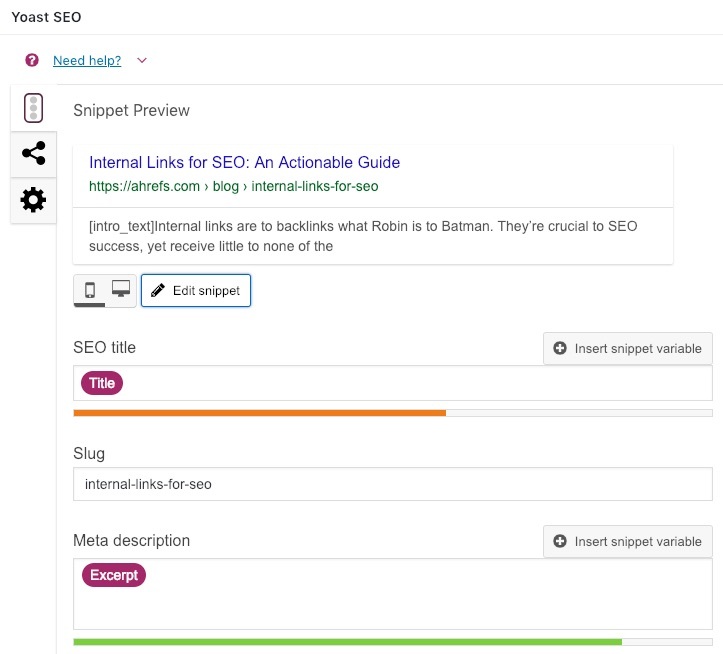 It’s free and simple to use, and it’s perfect for those who are new to on‐page SEO. Wanting to rank for a keyword doesn’t mean you deserve to, even if your traditional on‐page SEO elements are on‐point. That’s because of something called search intent. Naturally, searches with a high level of commercial interest are more valuable from a business point of view since the people doing them are closer to purchasing (i.e., further down the marketing funnel) and thus more likely to spend money if they land on your site. But search intent isn’t always crystal clear from the search query itself. 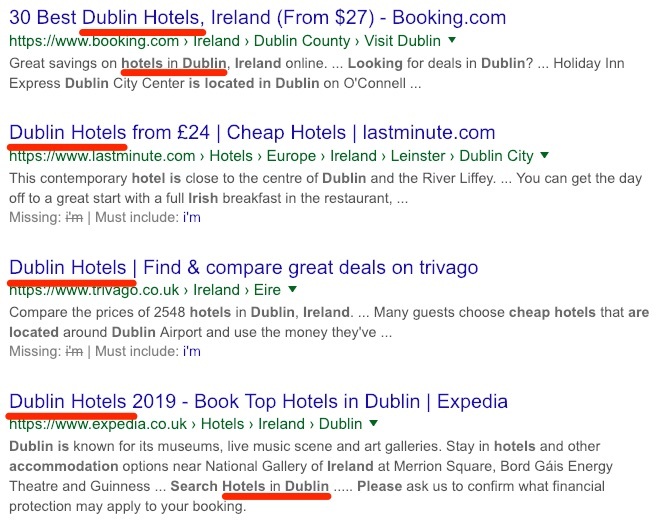 Now, you might be thinking “my hotel is the best hotel in Dublin, so this is probably a transactional term for which I can rank my homepage,” right? Not so fast. 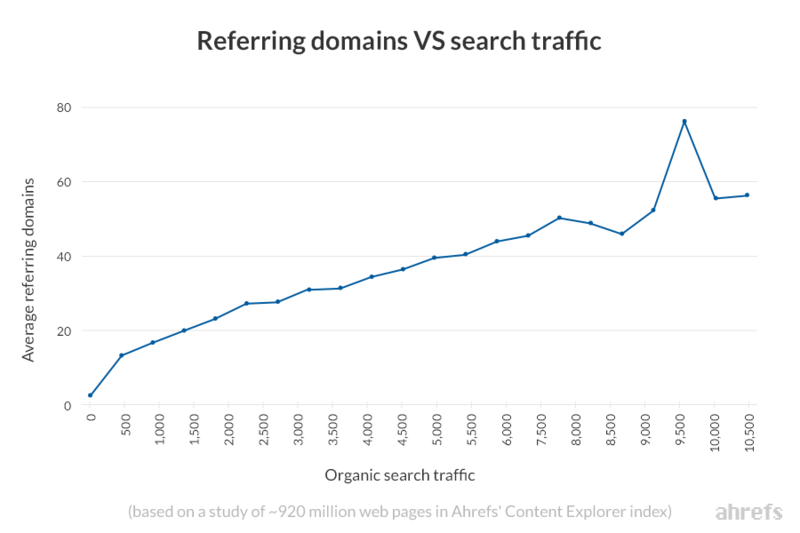 The best way to understand the intent behind any search term is to see what pages rank for it. 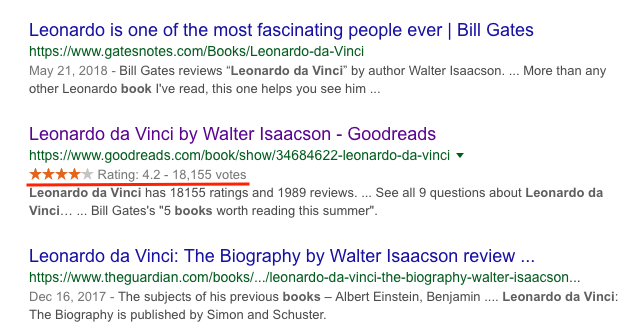 Here you can see that almost all of the top‐ranking results are blog posts and listicles—i.e., informational results. The logic here is that because Google’s primary goal is to satisfy its users, their algorithm keeps a close eye on the behavior of people searching for a particular term and tries to offer results that will meet the intent of their search. Thus, you can infer search intent by looking at the commonalities between the current top‐ranking pages. Never create content without first understanding the search intent behind the query you’re targeting. The web address of your page sends a signal to search engines about its topic. Getting this right the first time is recommended because you should avoid changing it, if possible. The other benefit of descriptive URLs is that they often include your target keyword (or at least words and phrases from it). That said, don’t shoehorn keywords into URLs if they look unnatural. Contrary to what the name suggests, the meta title tag does not appear anywhere on your page. It merely sets the name of the browser tab, and Google and other search engines use it when showing the page in search results. Google doesn’t always respect the title tags you set. They sometimes choose to display something slightly different. is compelling enough to make searchers click and visit your site. Conventional wisdom also suggests keeping yours under 60 characters to avoid truncation in full in search results. However, it’s not so much about the number of characters but rather pixels. Therefore, it’s a good idea to use a SERP pixel tool to make sure your titles don’t get cut. Meta descriptions are also important, mainly because they too can affect the click‐through rate. If you want to avoid the risk of truncation, your meta descriptions should not exceed ~155 characters. Use the pixel tool mentioned above to keep them within limits. Use the standard HTML format for headers (H1 to H6) to make it easy for search engines to understand the structure of your page and the importance of each section. Header 1 should be reserved for the on‐page title of your content and should ideally include the main keyword (or something closely related to the main keyword) that you’re targeting. You can have more than one H1 tag per page, but we recommend sticking to one. Header 2 should be used for the titles of the main sections on your page. They should also include the main keyword you’re targeting (whenever possible and natural—don’t shoehorn!) and are a good place to add additional (longer‐tail) keywords for which you want to rank. Every time you go a step deeper in your content, use the next type of header, e.g., Header 3 for subheadings within an H2 section, and so on. Following a clear and exhaustive structure makes it easy for search engines to categorize your content and also helps human readers. Images are great for humans, but search engines can struggle to make sense of them. Google is 91% sure that this is a photo of cheese, which is wrong. To help Google (and other search engines) understand your images, you should use the alt tag to describe and explain them. In this case, a good alt tag would be alt=”Butter”. To get started with using Schema, you should check out the official documentation and these tools that allow you to generate and test structured data. Check out our full guide to on‐page SEO to learn more. When doing SEO, it’s important to remember that you’re working for two separate customers—your human readers, and the bots search engines use to index your website. While bots are becoming more intelligent and human‐like, many differences still exist between the two. Therefore, your goal should be to create a positive experience for both humans and bots. Understanding how to create pages optimized for bots can be challenging. That’s why, while it’s important to have a strong understanding of the features we discuss in the following paragraphs, I encourage you to delegate them to a professional (preferably a developer). Still, here are a few tips to get you off on the right foot. NOTE. I’ll keep this section relatively short and straightforward, as I don’t want to get bogged down with too much technical mumbo‐jumbo in this guide. Both humans and search engines prioritize the loading speed of websites. Studies suggest that up to 40% of people leave sites that take longer than 3 seconds to load. 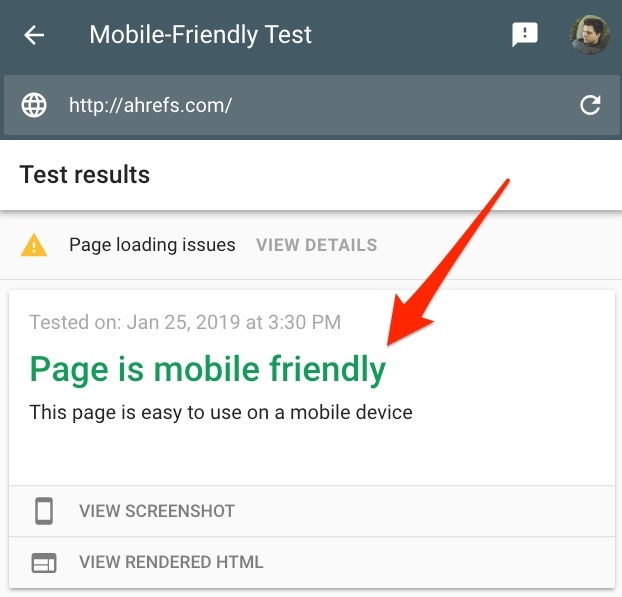 Using Google’s PageSpeed Insights tool or GTMetrix can help you find out how quickly your pages load and give you actionable advice on how to further improve their speed. If you want to analyze all pages on your site at once, run a crawl in Ahrefs Site Audit and check the Performance report to see which of your pages need further optimization for speed. According to one study, more than 60% of searches are now from mobile devices. HTTPS is officially one of the ranking signals Google uses. Not using an SSL certificate can also be a security issue—especially if you’re running an ecommerce site or accepting form submissions. Free options like Let’s Encrypt allow you to secure your website without breaking the piggy bank. A sitemap is an XML file which lists all the pages on your site. Search engines use it to find your content and understand how your pages are connected (i.e., see the overall structure of your website). Sitemaps do not affect rankings directly, but they allow search engines to find and index new pages on your website faster. While the sitemap lays out the full structure of your website, the robots.txt file gives specific instructions to search engine crawlers on which parts of the site they should and shouldn’t index. Having a robots.txt file is recommended because search engines allocate a crawl budget—the number of pages they’re allowed to crawl with each visit—to their bots. All major search engine crawlers and other “good” bots recognize and obey the robots.txt format, including AhrefsBot. The strategic linking of various pages on your website is a great way to increase the speed at which search engines crawl your site, and point them to your most important pages. There are various strategies for doing this, such as the hub‐and‐spoke strategy, cornerstone content, etc. These work but they can get complicated. For now, focus on creating a strong structure with plenty of links between relevant pages. 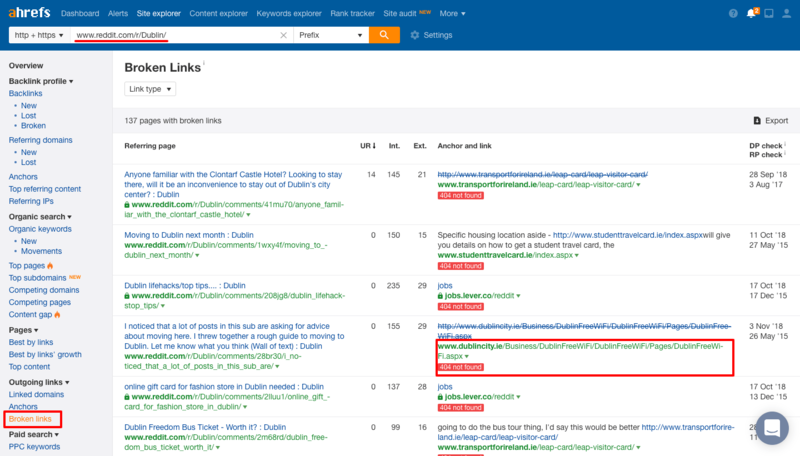 In our example, we can create a page that targets ‘Dublin guide’ and have it link to separate pages that cover ‘Dublin sights,’ ‘Dublin restaurants’, and so on. 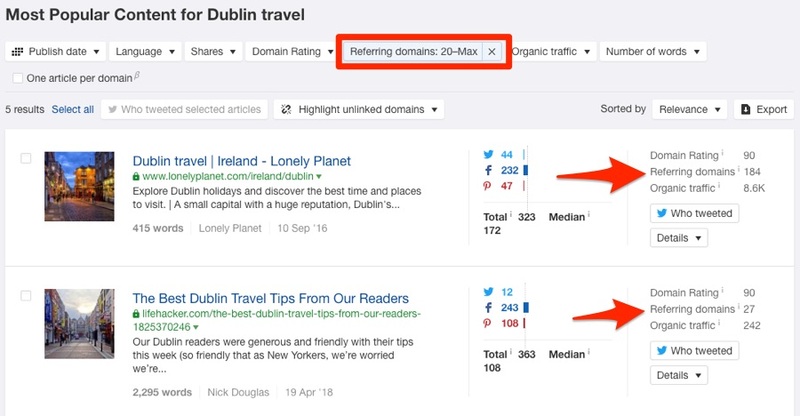 For example, if you’re looking to link to your Dublin guide, you can type site:yourdomain.com + “Dublin guide” (or “Dublin tips” or even just “Dublin”), and you’ll see all pages on your site from which you can add links. The structure of the data on your website plays a significant role in successful SEO performance. Read our guide to technical SEO to learn more. Link building is critical for the success of your SEO strategy, so if you’re prepared to spend resources (time, money, etc.) on producing content, you should also be prepared to commit at least as much time to promoting and generating links to your content. Why? Because there’s clear evidence showing that backlinks are one of the factors with a strong influence on Google’s ranking algorithm. There are many tactics you can use to get other websites to link back to your web pages. Some are more legitimate than others. However, before you start cherry picking “link building hacks” to try, take the time to review and analyze how your competitors are building links. It’s important to use your competitors because each niche is different and tactics that work great in one niche might not be so effective in yours. When done with this, consider some of the following tactics. Let’s say that we’ve just published an excellent Dublin travel guide. We put our heart and soul into this guide. It’s extremely thorough, the user‐experience is on‐point, and the information and recommendations are as up‐to‐date as it gets. It’s probably the best Dublin travel guide on the web. In other words, our Dublin travel guide is more deserving of links than any other one. Those two pages combined have links from over 200 referring domains (unique websites). Neither of those two pages is bad. They’re just not as good as the guide we’ve put together. So it may be worth reaching out to the folks linking to those pages and seeing if there’s scope for them to link to us too. To find out who links to a page, we can paste the URL into Ahrefs Site Explorer and check the Backlinks report. Not every link will be worth pursuing, but even after skimming the backlinks report for just a minute or two, I can already see a few good candidates from whom I’d love to get a backlink. 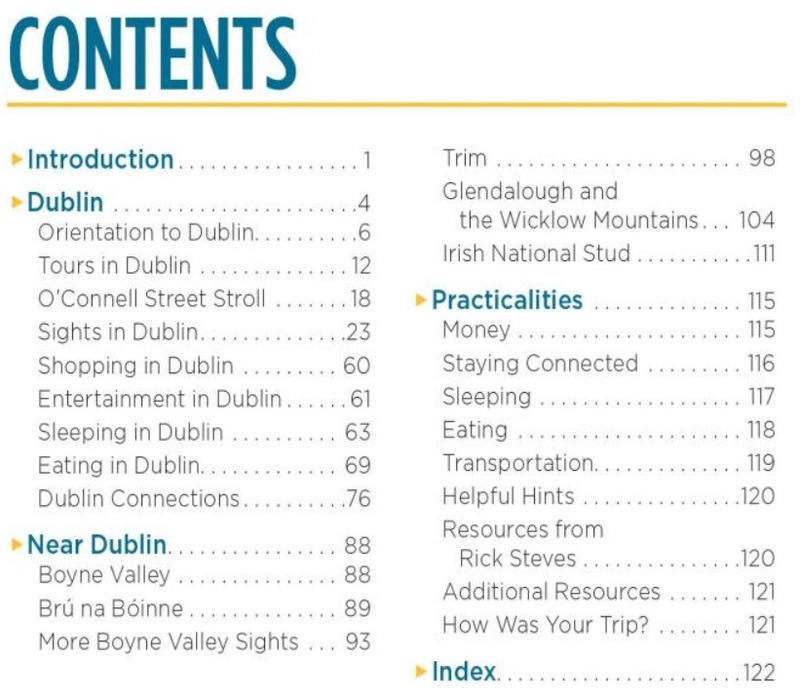 The page even links out to a few Dublin guides and resources, which makes it even more likely that they would be willing to include our guide. All that’s left to do is find the email address of the person responsible for the site and let them know about our content. Broken link building is where you find relevant broken pages (with backlinks pointing to them) on other sites. You then reach out to the people linking to the dead resource to suggest that they swap out the dead link for a suitable replacement on your site. Sound confusing? Let me show you how to do it. I find one that looks interesting. Based on the text on Reddit, this page contained a map of public WiFi areas in Dublin. You can also use the Wayback Machine to find out what the page used to be. Now I can create a similar page on my website and reach out to the owner of this site (and other sites linking to this missing page) to suggest that they replace dead link with a link to my guide. To learn even more about this tactic, check out our guide to broken link building. Guest blogging is where you write for another website in your industry. Many people think guest blogging is dead because a while ago Google published a “warning” about using guest posting for link building. Google does not discourage these types of articles in the cases when they inform users, educate another site’s audience or bring awareness to your cause or company. However, what does violate Google’s guidelines on link schemes is when the main intent is to build links in a large‐scale way back to the author’s site. So as long as your guest posts are helpful, informative and quality, you don’t have to worry. You publish on an authoritative website with a large relevant audience. You create a high‐quality piece of content, which is helpful to the audience of the website on which it is placed. You link to relevant resources on your website that will further help the audience expand their knowledge on the topic. When followed, these turn guest blogging into a great tool for brand‐building, generating referral traffic, and improving rankings. To learn how to use guest posting to generate links at scale, check out Ahrefs’ guide on the topic. These tactics are just the tip of the iceberg. There are many additional ways to build links. To learn more about link building check out our list of 9 easy link building strategies, or some of the individual guides listed below. The final step in setting your SEO strategy is figuring out how you’ll track your performance. There are many methods and metrics you can use, so it’s easy to get confused. My advice is this: focus on the basics. The most important metrics when it comes to SEO are a) organic traffic, and b) the average ranking position for the keywords you’re targeting. 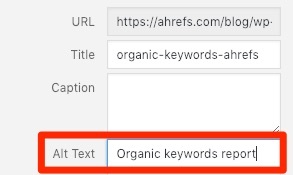 You can also use Ahrefs Site Explorer to keep an eye on your organic traffic along with the number of keywords your website ranks for, the organic positions it holds for various keywords and more. Another important thing you should measure in your SEO strategy is how your content ranks on Google over time. One way to do this is by using Google Search Console where you can find data about the average position, impressions, and clicks you get for various keywords. 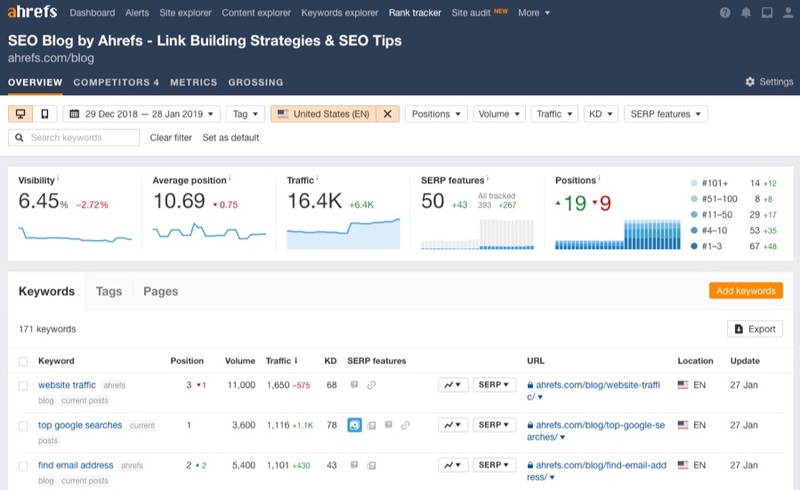 You can also use Ahrefs Rank Tracker for this purpose—it lets you track up to 10,000 keywords, see how rankings are improving (or declining) over time, and compare to the competition. There’s also the option to schedule a weekly or monthly email update with all of the above. Search engine optimization (SEO) can be competitive, but it is still by far the most effective way to drive sustainable traffic to your website. Moreover, the efforts you put in optimizing your website for search add up over time, helping you get even more traffic as long as you’re consistent with SEO. Over time this process will help you build up the authority of your site, and you will be able to rank for more competitive keywords with high search volumes. If you think I missed some other crucial search engine optimization basics, please let me know in comments!